Jake Guentzel's second goal of the game, at 2:44 of overtime, gave the Pittsburgh Penguins a 3-2 win over the visiting Florida Panthers on Tuesday. 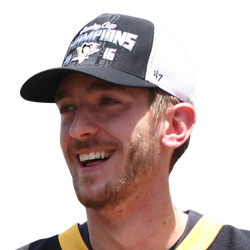 Guentzel took a pass from Sidney Crosby and outbattled Florida's Michael Matheson at the blue line, drove down the slot and backhanded the puck past goaltender Roberto Luongo for his 33rd goal. Crosby, who earlier in the game reached the 1,200-point level of his career, had a goal and two assists. Matt Murray stopped 32 shots for the Penguins, who are 3-0-2 in their past five games. Henrik Borgstrom and Vincent Trocheck scored for Florida, which lost its fifth straight (0-1-4) and is now 10-12 in a league-high 22 overtime games. Pittsburgh forward Matt Cullen was honored before the contest, one that made him the second American-born player to reach 1,500 career games. On the game's second shift, Pittsburgh's Evgeni Malkin tripped Florida's Aaron Ekblad, and the Panthers cashed in on the power play for a 1-0 lead at 1:45 of the first. Borgstrom's shot from the left circle hit the stick of Penguins defenseman Erik Gudbranson in front, and the puck hopped over Murray. At 9:04 of the first, Pittsburgh's Patric Hornqvist batted a fluttering puck past Luongo, but it was ruled -- and upheld upon review -- that he used a high stick. The Penguins did tie it 16 seconds into the second. Matheson turned the puck over in his end, and Pittsburgh's top line went to work. Crosby pounced on the puck and got it to Jared McCann, who set up Guentzel. Crosby's secondary assist was his 1,200th point, and he got 1,201 at 10:01 of the second with a power-play goal for a 2-1 Penguins lead. He scored into a vacated net on a juicy rebound of a shot by Phil Kessel. It was Crosby's 30th goal, his ninth time reaching that mark. Trocheck, a native of suburban Pittsburgh, tied it at 17:31 of the second. From a sharp angle to Murray's right, he one-timed a pass from Mike Hoffman inside the near post.